Job Hunting Resources - Imperium Opes Consulting, LLC. You need a great resume to make a great impression. In today's job market, you cannot succeed in your job hunt using the same tactics from decades ago. Hiring managers and recruiters use sophisticated software and technology to sort through candidates, which enables them to find the right person for the job. If you don't have the right kind of resume, with the right wording, then you won't even make a hit on their radar. Even if you did somehow hit their radar, a poorly written resume will quickly get thrown in the trash, which is why you need a professional resume, written by experts who specialize in resume writing. Just like you have writers who specialize in advertising, specialized speech writing and technical writing, there are also writers who specialized in the needed service of resume writing. These writers are crucial because they keep up with the technology and requirements of the hiring industry. They know what works and what fails. You might be the greatest at your career, but your career skills may not qualify you to produce a Do-It-Yourself (DIY) resume that will match the success of a resume written by a professional resume writer. 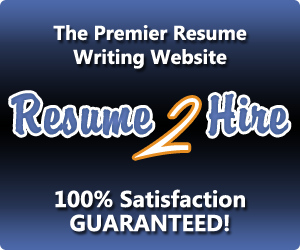 We have posted a banner below of a professional resume writing service, which we recommend because they offer a great service at an affordable price when compared to the many other service advertised on the internet. Note: We have an affiliate arrangement with the company represented by the banner below and are compensated when you purchase their services. Technology is constantly changing. What was fresh and new last year may already be outdated or updated. This is why you need to keep your skills updated when it comes to software, services and other technologies utilized in the marketplace. This is especially true, if your career field is dependent on certain software. We suggest you take a look at the service we have listed below and make sure all of your skills are updated. Take a look at the classes they offer and self-audit your skills. If you need new skills or updated skills then sign up for an affordable online course.